Description: The Insider dominated the media on publication in March 2005 and instantly became a No. 1 bestseller. Not only did it fill thousands of column inches with its revelations about prominent political and showbiz figures, it was critically acclaimed across the broadsheets for its unique and fascinating insight into the worlds of celebrity, royalty, politics and the media. Piers Morgan was made editor of the News of the World, the UK’s biggest-selling Sunday newspaper at the record-breaking age of 28. The decade that followed was one of the most tumultuous in modern times, a period in which we witnessed the self-implosion of the Tories, the rise of New Labour, the Royal Family brought to its knees by scandal and tragedy, horrific news events like Dunblane, September 11, and the war in Iraq – alongside a seemingly endless supply of fantastically entertaining sport and celebrity gossip. 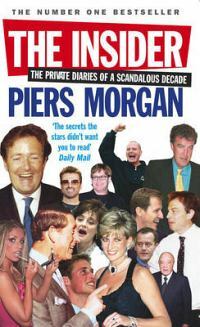 In a world of indiscreet dinners, private meetings and gossipy lunches, Piers Morgan found himself in the thick of it. ;His diaries from this remarkable period reveal astonishing and hilarious encounters with an endless list of celebritles and politicians alike: Diana, William, Charles and Camilla; Tony Blair, Cherie, Gordon Brown; Paul McCartney, George Michael and Elton John; Jeremy Clarkson, Paula Yates and Gazza to name just a few. Entertaining, engaging and compulsive, The Insider has been the most talked-about book of 2005, blowing apart every notion we have about politics, media and celebrity in twenty-first century Britain.